I would be suprised if someone were to show me a more detailed book on tracking animals by what they leave behind. Beautiful watercolours show you every pellet, stool, dropping, gnawed nut, pine cone and hoof print you could imagine. Some of the paintings of gulls pellets are exquisite. Details of hoof prints, gaits, how often the animal urinates and how to identify stools by smell. I can't wait for that pine martin to poo in our woodshed again, this time I feel confident to identify by it's perfumed musty aroma. This book covers the whole range of signs of animal presence: tracks, droppings, gnawed seeds and cones, burrows and so on. It's translated from Danish, I think — something Scandinavian, anyway — so it covers all the British species plus a few like wolf and beaver that we haven't had here for a few centuries.It's interesting to read and seems very good; I will probably never use it much as a field guide, which is what you would need to do to really get a handle on this stuff, because it's just an extra book to carry. The sooner all these guides are available as apps and ebooks the better.But it's nice to have as a reference, and I've already learned at least one thing from it: I realised that a hole I found last year with the remains of a wasp nest at the bottom was probably dug up by a badger. So that's cool. A good range of wildlife signs primarily covering birds and mammals. Quite a wide area covered, so if you don't have some of the bigger animals in your area - for example, Britain doesn't have bears or wolves - a fair amount of the information will not be relevant, however it's still an interesting read. 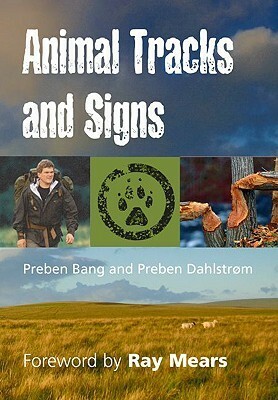 Really great book, contains many animal tracks and clues which them might leave.The writing is clear and easy to understand, I really enjoyed reading about how you tell how fast the animal was moving.Good book, recommend it to anyone who likes the outdoors.